Set on a one hundred acre private estate, The Serai Jaisalmer is inspired from the royal caravan sites of Rajputana; blending heritage and luxury. 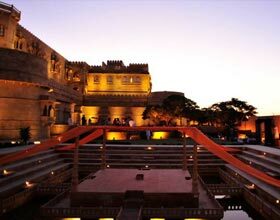 There is no better place from which to venture into the mystical environs of Jaisalmer to discover its fabled golden fortress, a UNESCO World Heritage Site. Evenings are spent under the vast expanse of the desert sky, punctuated by the stars and ancient melodies of Manganiyar folk musicians whose songs have haunted these dunes for centuries. The Sarai Jaisalmer desert camp and spa was established in 2008 is a spectacular getaway. 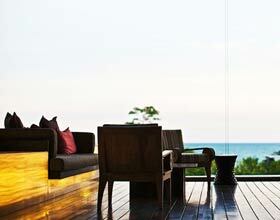 In its first year, The Serai was an early Indian property to become a member of Relais & Châteaux. Many of the experiences created exclusively for the resident guests at The Serai would not have been possible without the collaboration of local communities in the area. The 21 tents at the Sarai are a delightful symphony of styles. 14 tented suites offer spacious accommodation and cover an area of over1000 sq. feet. 6 luxury tented suites have their own private walled–in garden and sunken, pool with Jacuzzi jets. The exclusive royal tented suite has its own pool, spa, dining and lounge tents, all as a private exclusive enclosure. The Relais & Châteaux properties around the globe are unique and reflective of the local people and their cultures. 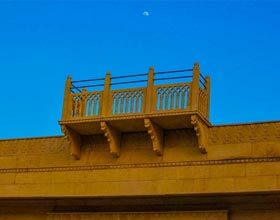 The Serai, Jaisalmer serves local delicacies as well as western culinary experiences drawn from inherited recipes. The Spa at the Sarai Jaisalmer, comprises of 4 tents with interiors that induce soporific charm and a sense of well–being set within a walled garden. A diverse menu of therapies which include both western and eastern treatments.